I had heard of but did not know anything specific about Grant Achatz and his Chicago restaurant Alinea prior “reading” (i.e., listening to) Life, On the Line: A Chef’s Story of Chasing Greatness, Facing Death, and Redefining the Way We Eat. 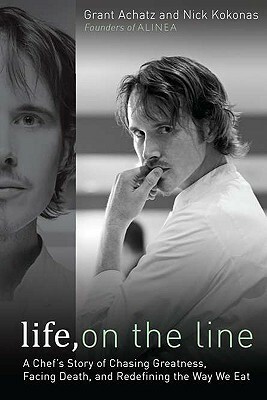 The book is cleverly and accurately titled, as it tells the story of Achatz’s career as a chef working “on the line” in various kitchens (including for such luminaries as Charlie Trotter and Thomas Keller) and it also tells the story of Achatz’s diagnosis of and battle with the cancer that put his life “on the line.” Cruelly ironic was that he develped stage IV squamous cell carcinoma-tongue cancer at the same time that he was being recognized as one of the best chefs in America. I didn’t realize until I reached his chapter that the book was co-authored with Achatz’s friend and business partner Nick Kokonas. At first I thought, why do I care what the financier has to say? I want to know about the chef and his cooking. But then I realized having Kokonas as a co-author and alternating chapters between Achatz and Kokonas was very clever because it allowed Kokonas to say all of the very flattering things about Achatz that it would have been uncouth for Achatz to say about himself. And given his ability as a chef, those flattering things are a very important part of the story. This is one restaurant I want badly to try. Besides French Laundry. Some day!